You know since today is the Tuesday after a long holiday weekend. Making it like a Monday only even worse because it is the first day of the work week after not just two days off but three. But on the bright side it is Tuesday which means only four days until the weekend! One of the questions I get asked the most is if I have a favorite recipe and if I ever make the same thing twice. The answer is yes and yes. I actually have quite a few favorite recipes that I make over and over again. These are tried and true favorites that we all love and request often. They are easy and inexpensive to make (perfect for a Tuesday after a long weekend), earning mega tried and true points, and of course yummy in our tummies. Some of our top faves and the recipes I make several times a month when I am tired and exhausted, don’t feel like tying anything new, and recipes I always have the ingredients on hand are: Lemon Peppered Chicken, Sausage and Pepper Arrabbiata, Lentil Bean Soup, Chili Lime Tilapia with Roasted Corn, Texas Style Chili, burgers and pizza. 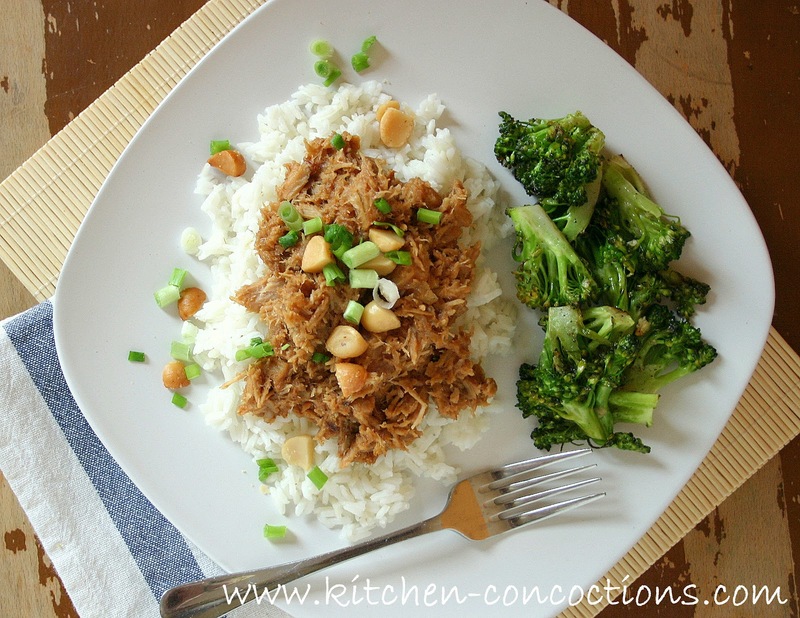 This recipe for Asian Peanut Butter Pork is another one of those recipes. Eric asks for this meal all. The. Time. So like the good girl I am, every time I can get a pork loin at a good price this goes on the menu. Twice. This is “Flashback Tuesday” because this is a recipe I originally made in my first few months of blogging (read the original recipe has a horrible almost unrecognizable photo since I knew nothing about food photography then, and heck I don’t know much more now). So I thought it deserved to be made beautiful and shared again. The recipe below is my tweaked and toned version of the original. It is one of our faves. Place pork loin in slow cooker. Combine remaining ingredients and pour over the pork loin. Cover and cook on low for 8 hours or on high for 4-5 hours. 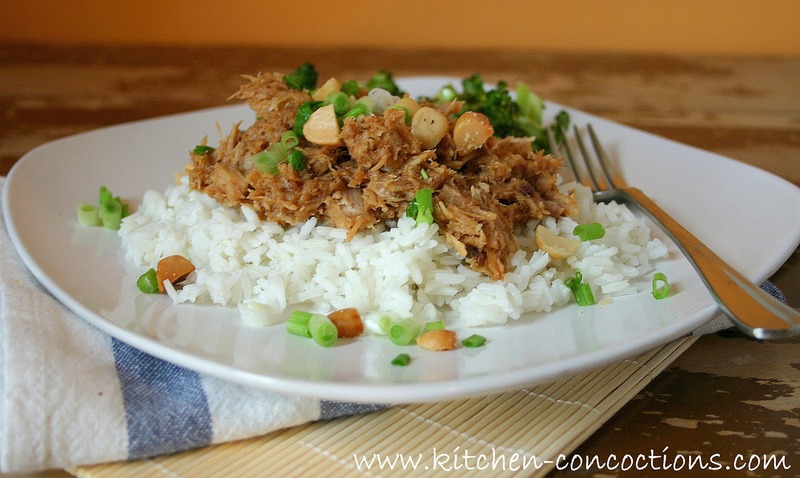 Once cooked, shred pork and mix with sauce. 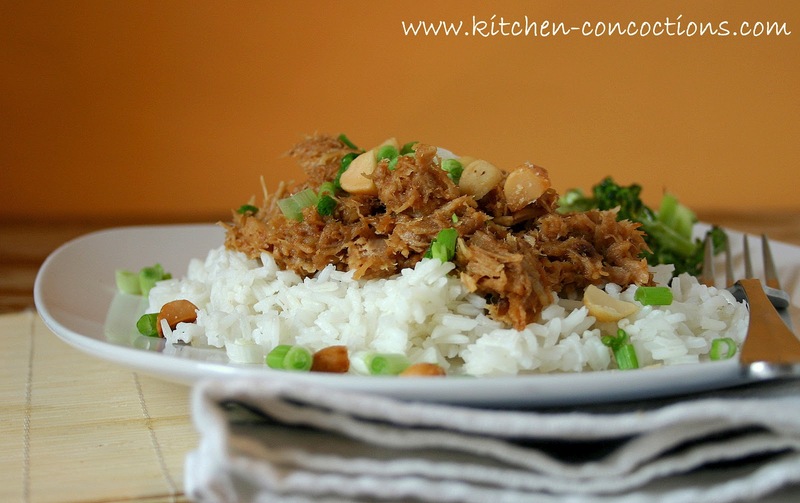 Serve over rice, garnished with chopped peanuts and green onions. Look delicious and super easy! I would seriously devour this. Now I just need to convice my husband to like savory dishes with peanut butter!